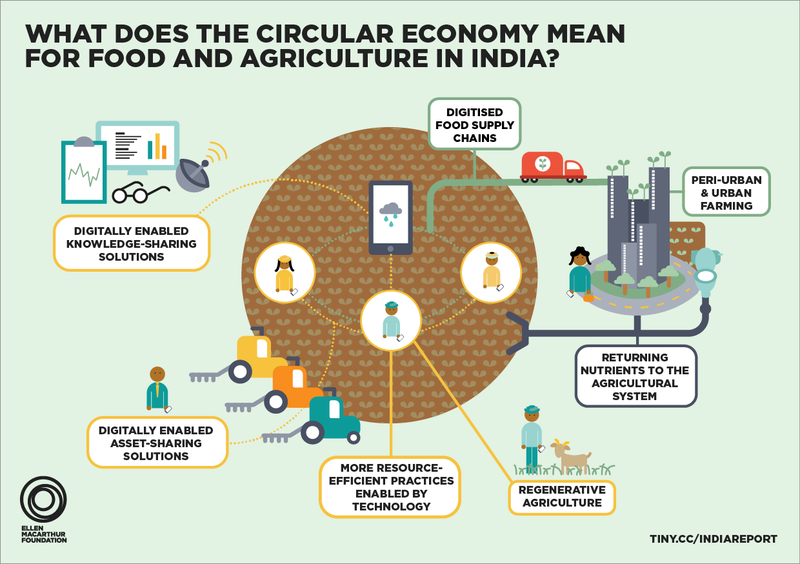 Scooper - Technology News: Is India ready to embrace the circular economy? Is India ready to embrace the circular economy? In the last decade, India has experienced considerable economic growth, averaging 7.4% annually. If this trend continues, the country could become one of the four biggest economies worldwide in about two decades . Yet this positive indicator does not come without serious questions, and the nation is still facing challenges related to rapid urbanisation, resource scarcity, and a large part of the population living below the poverty threshold. In an interconnected world predicated largely on a linear 'take, make and dispose' economic model, the upcoming Indian powerhouse could embark on an industrialisation path comparable – albeit faster – to that of mature markets, with the associated negative externalities it entails. But this scenario is not inevitable, and with its young population and nascent manufacturing sector, the country is in a position to make systemic choices and bend the road ahead. So could a digitally-enabled, circular model of development provide some of the answers to the most pressing questions that India faces today? With a very strong connectivity backbone - India is now the second largest market for smartphones , having surpassed the US - the country is embracing the digital revolution, one which guided by circular principles and enablers such as asset tracking and sharing, can yield significant benefits, as highlighted by a study produced last spring by the Ellen MacArthur Foundation and the World Economic Forum . Moreover, several building blocks of circularity are deeply ingrained in Indian habits, as exemplified by the high rates of utilisation and repair of vehicles and the distributed recovery and recycling of materials post-use. Often handled informally, these activities provide the only source of livelihoods to some of the poorest populations. By turning these existing trends into core development strategies, India could generate significant economic savings, massively cut down on carbon emissions - not a mere detail for a country which has recently ratified the Paris Climate agreement - and deliver better prospects for its citizens. Building on the work carried out to map the circular economy opportunity for Europe, the Ellen MacArthur Foundation, supported by ClimateWorks and with UNCTAD as a knowledge partner, has analysed the potential of circularity applied to three focus areas of the Indian economy: cities and construction, food and agriculture, and mobility and vehicle manufacturing. Household expenditure in these three combined areas represents more than two thirds of that of the average Indian household, both in urban and rural areas. They cover the two largest industrial sectors in terms of employment (agriculture and construction), and highest growth expectations (construction and vehicle manufacturing). 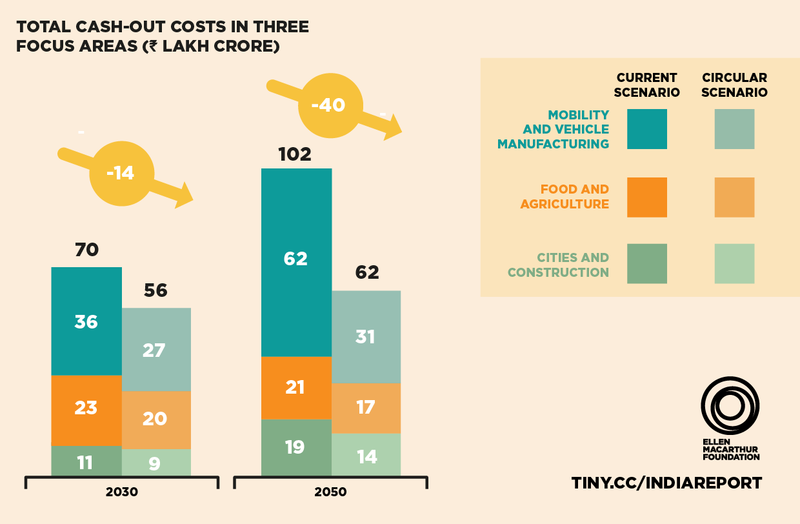 The findings of this study are compelling: adopting a circular economy pathway would yield annual benefits of ₹40 lakh crore ($624 billion) by 2050 compared with the current development path – equivalent to 30% of India’s current GDP. In addition to creating cost savings for businesses and households, a circular transition would reduce negative externalities: greenhouse gas emissions would be 44% lower by 2050 compared to the current scenario, and congestion and pollution would fall significantly, leading to health and economic benefits to Indian citizens. And what could it look like? Taking the example of food and agriculture, digitally-enabled precision farming coupled with equipment sharing platforms and regenerative practices that return nutrients to the soil would have multiple positive outcomes: reduction of costs for farmers, real-time knowledge sharing for faster dissemination of best practices, and importantly, reduction of input requirements (fertilisers and water, a crucial resource since according to the World Resources Institute, demand could exceed supply as soon as 2030 ). Regenerative agriculture is already gaining momentum in India. Organisations like INORA, Kalpavruksha Farm, Organic India, and Govardhan Ecovillage are applying such practices at different scales and report increasing yields, health, and income. Farmers in some of India’s poorest regions are recording unprecedented rice yields , thanks to regenerative practices. The northeastern Himalayan state of Sikkim is now growing 100% organically , after spending some 13 years converting 75,000 hectares of land to organic agriculture. The effort has increased farmers’ income by 20% and avoided the deterioration of human health and degradation of the environment that other food-producing states are experiencing. From the perspective of mobility and housing, the two other key focus areas of "Circular economy in India: rethinking growth for long-term prosperity", the advantages highlighted combine net resource savings for industry (representing the bulk of the benefits highlighted above) and better outcomes for customers and citizens. A multi-modal, integrated transport system including strategies for repair, remanufacturing, and recycling of vehicles would notably reduce energy consumption 32% by 2030, whilst helping to move towards mobility for all. For the construction sector, choices made today are set to have a colossal impact, considering that 70% of the building stock that will be used in 2030 is yet to be built . Given that construction is set to become the largest consumer of raw materials in India by 2020 , moving to modular practices and careful materials choice editing would help contain the negative externalities (landfill, emissions from virgin materials production) that are bound to skyrocket as demand soars. Capturing these opportunities will naturally require conscious choices as well as a collaborative public - private dialogue, but focused government initiatives suggest that the time is ripe for India to embrace circular economy approaches. By choosing a circular development path, the country could bypass the linear lock-ins that have arisen from industrialisation and are now only starting to be addressed in mature markets - will India upgrade directly to the Fourth Industrial Revolution, and move to a contemporary model of regenerative and restorative growth, by design, that builds economic and natural capital rather than rely primarily on the consumption of finite resources?